Completely insulated with Mustang Airsoft™ foam to deliver an immersed Clo value of 0.420, the MS2175 22 deluxe suit delivers significantly more hypothermia protection than just a jacket or pant. This, combined with maximum flotation in the event of accidental water immersion makes the MS2175 22 an excellent choice for activities around colder Northern waters. The MS2175 22 includes the USCG Marking Package. 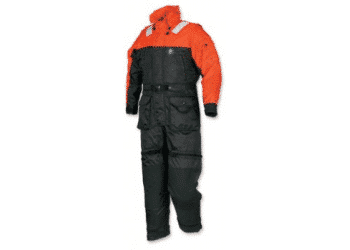 Mustang Survival flotation suits are designed to protect the wearer from foul or cold weather, and use closed-cell foam to offer flotation and hypothermia protection in the event of water immersion. Tug-Tite® technology and Velcro™ wrist and ankle closures improve fit and limit water flushing if immersed, SOLAS reflective tape enhances visibility and an inflatable head support pillow. Featuring two chest pockets, large front cargo pockets and an inflatable head pillow for additional in-water support and buoyancy, this suit blends functionality and features to meet the demands of a wide-range of professional and industrial uses. Mustang Survival flotation suits are designed to protect the wearer from foul weather, and use closed-cell foam to offerflotation and hypothermia protection in the event of water immersion. Tug-Tite® technology and Velcro™ wrist and ankle closures improve fit and limit water flushing if immersed, SOLAS reflective tape enhances visibility and an inflatable head support pillow. "ICE RESCUE TECHNICIAN OR WATER RESCUE"